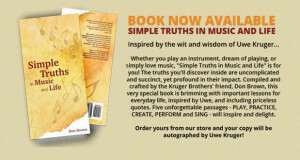 Don Brown has spent the better part of his career doing what he calls, “helping people with people.” He’s written five books, including his latest, Simple Truths in Music and Life. 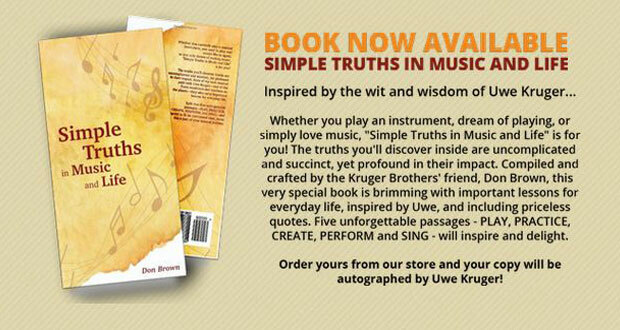 This latest project is a collection of wisdom gathered from Don’s experiences and time spent with Uwe Kruger of the Kruger Brothers. “Being a writer, I like to capture and simplify what I observe. After the second year, I went to Uwe and told him that I wanted to write about the journey I was having with music and the experience with him at the camp,” Don said. Uwe told him, “I don’t think people would care too much about what I have to say.” Don’s response; “I said I think you’re wrong.” Uwe gave Don his blessing and Don went about the research process. It took him several years after that, pouring through captured audio and video of Uwe’s teachings and interviews. “I even had a transcript of a Swiss television documentary,” he told me. The result of all of this research is a fabulous collection of 93 “simple truths” divided into four movements; Play, Practice, Create, Perform, and the coda, Sing. You can read it like a story, or you can crack it open somewhere in the middle and treat it like a daily dose of life and musical wisdom – something specific each day. There’s plenty of nuggets here to help you be a better musician, and even a better person. Order your copy on Amazon.com or contact Don directly at www.donbrown.org.